Indeed it is. Moreover, it’s not helpful to our cause when we throw around terms like socialist or sell out or insert-your-favorite-name-for-Obama, or other names I won’t mention here for the sake of propriety. Our mission is to win hearts and change minds. We cannot do that if we marginalize our opponents and use language that causes them to tune out anything we say after they hear the word socialist. Yes, the other side does it. Disproportionately and dishonestly. But sinking to their level will not “win the argument, then win the election,” as British Prime Minister Margaret Thatcher used to say. It will only perpetuate the stereotype that we are unhinged, uneducated rubes. We have the best arguments and we are right on the issues. If we can be winsome, happy warriors we will be more effective at getting our message across than than those who are ugly and hateful — and we’ll be a lot more fun to be around. Sometimes, the enemy of our enemy is our friend. If we can find common ground with non-traditional allies who will help us to accomplish our goals, we should try to do so. Though we should never compromise our core principles, it’s okay to work with people with whom we agree on one or just a few issues, whether they’re within our own party or outside of it. Earlier this year I attended a press conference with my friends Melanie Elsey and Rob Walgate from the American Policy Roundtable at the headquarters of the liberal group, ProgressOhio. You might be surprised to learn that there is a very cordial relationship between the two groups, despite their radically divergent missions. That day they were announcing their joint lawsuit against the governor’s JobsOhio program. Both believe it violates the Ohio Constitution and were able to put aside their differences to work together to fight for their shared principles on this issue. David Zanotti, APR’s president, recently said, “The law is what we’re about here. It’s about the law. We are equal opportunity offenders.” There are times when what is right will not fall cleanly along party lines, and we must be willing to look beyond blind party loyalty in order to advance our conservative agenda. Sometimes we miss opportunities to build coalitions without even realizing it. For example, we all know that a lot of teachers are against the new Common Core standards and that in many states, teachers unions and other groups have strongly opposed them, objecting to the excessive testing and merit pay for teachers. But the Common Core debate quickly evolved into a “right wing” cause in many states, Ohio among them. The “socialism” word started getting tossed around and parents complained that the curriculum would turn our children into Marxists. Glenn Beck became the face of the movement. What self-respecting liberal (or even moderate) Democrat would want to join that movement? If Common Core opposition in Ohio had received support of the teacher’s unions, you can bet more legislators would have listened to the appeals for repeal, and then that goal may not have been such a longshot. As it turned out, only a handful of conservative legislators support outright repeal of the standards and the teachers unions support keeping them in place. There is little stomach in the legislature to even modify the standards. We must consider who we can bring on board in future battles and — without compromising our core values — consider how we present our issues so we can build coalitions and attract as many activists to our cause as possible, whether we agree on every issue or not. If we can avoid being offensive (or making our cause so narrow that others shy away from it) without compromising what we believe, we should do it. 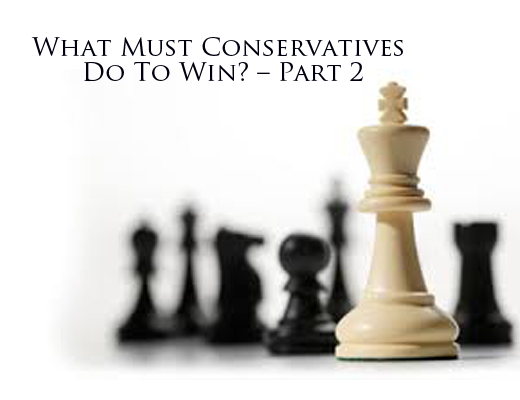 I renew my call from Part 1: I would love to hear your ideas on what conservatives must do to win. The goal should be to promote our values by electing candidates who promote what we believe and who will enact legislation that does the same. Paula Bolyard describes herself as a Christian first, conservative second, and Republican third. She is a member of the Wayne County Executive Committee and is owner and moderator of the Ohio Homeschool Yahoo! Group. She is a contributor at PJ Media Lifestyle, PJ Media, and RedState.